Terrie Williams, professor of ecology and evolutionary biology at the University of California, Santa Cruz, joins Jane Goodall and three other scientists as winners of the 2007 Women of Discovery Awards from Wings WorldQuest. Actress Uma Thurman will present the awards at a ceremony in New York on March 1. The winners of the fifth annual Women of Discovery Awards were selected for their groundbreaking work in one of five categories: sea, earth, courage, lifetime achievement, and field research. Williams is receiving the Sea Award in recognition of her research on Weddell seals in Antarctica. 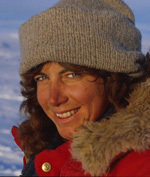 She wrote about her investigations and adventures in Antarctica in a book, The Hunter's Breath, published in 2004 (see related press release). In addition to Williams, the 2007 award recipients include primatologist Jane Goodall (Lifetime Achievement Award), glaciologist Erin Petit (Earth Award), archaeologist Constanza Ceruti (Leila Hadley Luce Award for Courage), and ethnobotanist Grace Gobbo (Field Research Award). The awards consist of cash prizes and sterling silver "Tree of Life" pins designed by artist Edwina Sandys. Wings WorldQuest established the awards to "recognize the contributions of women explorers who are pioneering discoveries on the frontiers of scientific research and human knowledge." Wings WorldQuest is a nonprofit organization whose mission is to promote scientific exploration, celebrate extraordinary women explorers, and inspire all women to explore their universe. For more information about the awards, visit the Wings WorldQuest web site.